A friend of mine went to Dubrovnik last Autumn and brought me back some black cumin seeds from a local market. I was quite daunted by the miniature charcoal chips at first as I had never come across them and they were packaged in a glass test tube – they looked either very precious or dangerous or possibly both…But I was intrigued (and had decided this particular friend was unlikely to carry dangerous substances through customs). Tasty as the cumin bread was, having looked up black cumin since, it would appear that this spice, Nigella sativa to its friends, has nothing at all to do with cumin and is regularly confused with other spices. I have added to the injustice of this poor elusive spice by masking its taste with (normal) cumin seeds! So this time I’m leaving out the (normal) cumin and have taken inspiration from the Middle East by sprinkling some seeds on top of the loaf to toast as the loaf bakes. The result is a subtly fragrant loaf; the toasted seeds give a slightly citrus, almost eucalyptus edge to the bread. Fantastic served with hummus or baba ganoush (see my recipe here) or dunked into a thick, warming soup whilst you stay inside out of the snow and eagerly await Spring. Come on Spring, you can do it! Toast two thirds of the seeds in a pan on a low heat for about five minutes. Sift the flours and salt together, adding any bran left in the sieve to the mixture. Add the toasted seeds. In a jug, mix the sugar and yeast into the water and pour this, a little at a time, into the dry mixture. Knead until the dough is soft and springy (this will take about 5 minutes with the dough hook attachment of a food mixer, a little longer if kneading the old-fashioned way). Form into a ball, place in a lightly oiled bowl, cover with clingfilm and leave in a warm place for about an hour (until it has approximately doubled in size). Knock back the dough, reform into a ball and place on a lightly oiled baking tray. Re-cover with clingfilm and leave in a warm place for another 30 minutes, until it has doubled in size again. Tip: Make sure the seam of your loaf is at the bottom so that it rises and bakes symmetrically. Sprinkle the remaining seeds onto your loaf and slash an ‘X’ into the top with a knife (so your loaf can expand freely in the oven). 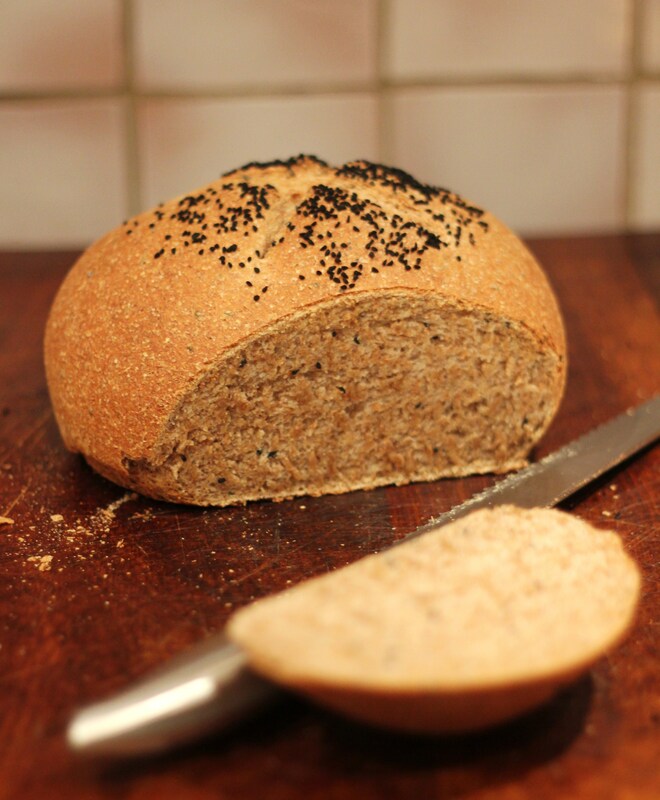 Tip: If your loaf is a little dry on top, spray some water on it to help the seeds stick. Bake for 25-30 minutes, until the loaf sounds hollow when tapped on the bottom. Tags: Baking, black cumin seeds, Breads, cumin seeds, dairy free, dough, easy, Nigella sativa, recipe, vegan, vegetarian, wholemeal. Bookmark the permalink.